In this example I will demonstrate the possibility to share EPiServer plugins between applications. The idea is to make this as seamless as possible without configuration or having to add front-end files into every project. What we will do is to create a class library project, build a release DLL and put this DLL into the bin folder of another project. And all of this will produce a new admin tool as depicted below. We create the plugin and what is worth noting here is the Url on line 4 (this is used with the route helper, see below) and the inheritance of the IPageTypeUsage interface on line 5. We will not use an ASPX file at all but instead add all the controls needed to the ControlCollection of the plugin page. And this must be added in the OnInit method in order to be able to use them properly. A little example of the AddControls method. Once added they will render properly without us having to doing anything in particular. In order for this to work without using an ASPX file and having a virtual path we will use the power of Routes. By inheriting PlugInAttribute on line 1 we can access the Start method (on line 17) and register the routes. And we register the route "PageTypeUsage.aspx" - which is the same as we specified on the plugin. Once this route is hit or accessed the GetHttpHandler method on line 4 is used. Basically this utilize a reflection search of the interface IPageTypeUsage and instantiates a PageTypeUsage object (on line 8). And voila! We have a plugin that we can share between different projects! In this post I will demonstrate the possibility to create an EPiServer 7 custom property and combine it with property attributes for edit mode configuration (which is utilized by a custom EditorDescriptor). This entire post has been revised and updated to work with EPiServer 7.5. What I have created is a custom property to let the editor create key-value items that can be used to render, for instance, a drop-down list. In order to achieve this we have to create the files marked in blue in the image below. And I will go trough each and every one of them to try and explain how to create a custom property in EPiServer 7.5. Three things are of importance here. 1. The BackingType attribute specified on line 5 which is specifying what property to use when retrieving and storing data. I have edited the file and in the above code only display the essential (the source code for all files are found at the botton of this post). The are two classes here: 1. PropertyKeyValueItems, 2. KeyValueItem. PropertyKeyValueItems is used to retrieve and store the value from editor input. Since the property is of type 'IEnumerable' as specified in property 'PropertyValueType' but it does in fact inherit 'PropertyLongString' we need to serialize and deserialize the data and this is done in property 'Value'. The 'KeyValueItem' class is simply used to help with the serialization and deserialization. This is a class used to dress up a specific property. In this case we say that the value the key is 'Name' and the value is 'E-mail'. We send all of these calues up to the front layer with the help of the EditorDescriptor coming next. This is the piece of code that binds everything together (back-end with front-end). First we need to specify that whenever editing a property of the type 'IEnumerable' then this is the code to use (line 1). In the constructor we specify which front-end code to use (line 6, more on this path late i 'module.config'). Third we override the 'SetEditorConfiguration' method and simply reads the 'KeyValueItemsAttribute' and its properties and add them to the EditorConfiguration property we get when inheriting the 'EditorDescriptor' class. This config file specifies the base path for the client resources used by our custom front-end code (on line 8). This is what makes the 'ClientEditingClass = "episerver75.editors.KeyValueItems";' work in the EditorDescriptor class described above. Any styles needed for the front-end custom property. This is where we read the parameters we specified in 'KeyValueItemsEditorDescriptor'. This is where we makes sure if the user input is valid or not. This is used to calculate the new value based on user input. This is in this cased used to get the value stored in the database and render the controls. This is the method to render the controls base on a single KeyValueItem value. This is an example of how to render the property as a drop-down list. Ever wanted to help your EPiServer 7 editor with choosing from a set of options in edit mode? In this example we work with the hypothetical scenario of letting an editor chose to display teaser or not (and in the next post I will demonstrate how to set default values with property attributes). We achieve this by utilizing a generic data annotation attribute for a property and configuring editors for EPiServer 7. The image above depicts what we will achieve, a simple drop-down list with the options "Yes" and "No" (we'll discuss the default in the next post). However, this generic attribute and editor configuration we will create will also handle rendering the options as check-boxes, such as the image below. First we create the attribute. The idea here is to add a string with the options as well as the type to be rendered (either drop-down list or check-boxes) and if we should add an empty selection to the drop-down list or not. Basically a string with this pattern "Text1:Value1;Text2:Value2;TextN;ValueN" is passed into a the constructor and parsed into the property Items of IEnumerable<ISelectItem>, as displayed below. Ok, so now we have the attribute but now we need to configure the editors in order to render the property properly in edit mode. Basically you inherit the EditorDescriptor class and override the ModifyMetadata method. 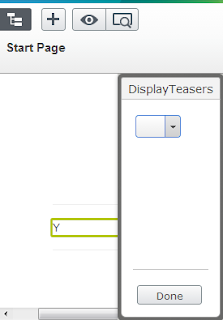 The hook-up that connects the property (in this example "DisplayTeasers") and the EditorDescriptor is made by both the property's attribute and the EditorDescriptor class EditorDescriptorRegistration UIHint having the same value of, in this example, "ListItems". Based on the ListItemsAttribute and its ControlRenderType we either render a drop-down list or check-boxes. We also specify a custom SelectionFactoryType, as described below, and it is this piece of code that supplies the editor control with the specified options. We read the the ExtendedMetadata variable supplied in the method and get the ListItemsAttribute which contains all the items to be rendered. And all of this together let us define an input field in edit mode with a data annotation attribute.